In linear power supply design output regulation is not a question because it is easily done by the linear regulator inserted before the load. Nowadays linear power supply is not anymore widely used. What is drawing more attention now is the switch mode power supply. How switch mode power supply regulates its output is different from what linear regulator does. For detailed explanation how linear regulator provides output regulation you must read this. If you are not familiar yet how a switch mode power supply works, you should consider reading this. A linear power supply obtains its regulation through the linear regulator inserted in series with the load. This is a non-preferred method in power conversion because of the huge losses. In switch mode power supply, the output is being sampled and feedback to the controller. The feedback signal is then compare to the internal reference of the controller (there are also some cases that the reference is external). A regulation is then attained when the reference and the sampled signal equal each other. This is how switch mode power supply regulates its output. To have a better grasp on how switch mode power supply regulates its output, let us consider a simple boost converter below. May be you are confuse why I introduce a boost converter and what we are talking about is a switch mode power supply. Actually a switch mode power supply is made up of switching converters. That is why it is called switch mode due to core circuit that is switching converters. Boost converter is a switching converter that can provide a higher output voltage from a lower input voltage. Above circuit is an open loop boost converter. Open loop means that the output is non-regulated. With an open loop boost converter, the output will keep on increasing. This is undesired. In order to establish regulation, there must be an additional controller. 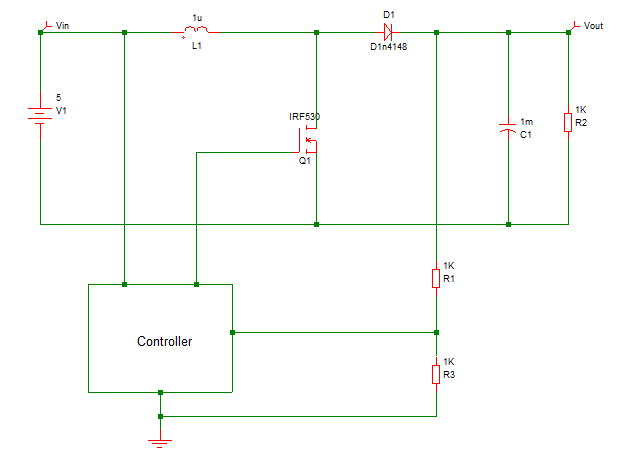 In below circuit, a controller is added. The output is being sampled by a divided resistor and feedback to the controller. The sampled signal will be compared to the internal reference of the controller. The reference and the sampled signal must be equilibrium in order to obtain regulation. So every time the output increases, the controller will react and until the sampled feedback equal to the reference. The same scenario when the output decreases, the controller will react until the desired regulation in reached. During dynamic load, the output may swing too low and too high. In order to solve this issue, a good compensation circuit is added. How switch mode power supply regulates its output is actually through the principle of a control system. As you can see in the above schematic, there is feedback information. The feedback signal is then compared to a reference. The error will then be processed by the controller then modify the behavior of the plant. If we translate it into a diagram, it should be like this. Nowadays there are single IC controllers already. No need for the external compensation circuits. All you need is to sample the output and feed it into the controller pin. Power loss is not an issue on how switch mode power supply regulates its output. Unlike linear regulator which is inserted in series to the load, in switch mode power supply the load current will not flow to the controlling element. This simply results to a higher efficiency and more preferred for high power applications.